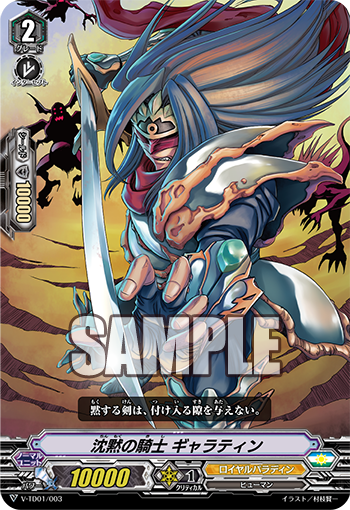 The Japanese card of the day for April 4th, 2018, is the familiar Royal Paladin vanilla Knight of Silence Gallatin from V-Trial Deck 01: Sendou Aichi. Gallatin hasn't stopped being a vanilla in the Standard format, but he has been tweaked slightly to reflect the updated game mechanics. In the old vanguard, the standard power for a grade 2 with a skill was 9000, and vanillas compensated for their lack of skills with 10k bases; in Standard the normal base power is 10k already, and vanillas instead have increased shield value, on par with grade 1s. The additional 5k shield is potentially more significant than being an 11k base could ever be, as it synergizes directly with grade 2s' defensive role as interceptors. The majority of grade 2s have a shield value equivalent to half a trigger in the new format, due to triggers being retooled to grant +10k power rather than 5k. That doesn't necessarily guarantee vanillas a place as a staple in your deck, but it does give you a safe fallback when other options are undesirable for your build. Because Gallatin is essentially unmodified from the Stardrive Dragon Start Deck, Royal Paladin fighters can keep using their alternate-background vanillas from the prerelease demos if they want. 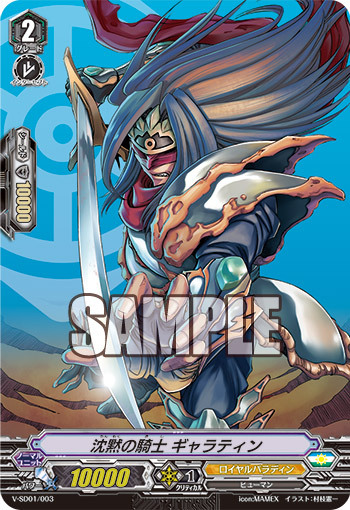 Bushiroad has not set any concrete dates for when English demos are to begin beyond "June," but the Japanese Spring Caravan began back in March and will continue to distribute Royal Paladin Start Decks through April 6th. The previous Japanese card of the day was Vortex Dragon. V-Trial Deck 01: Sendou Aichi and V-Trial Deck 02: Kai Toshiki will launch in Japanese May 11th, 2018, and in English June 8th, 2018. They will be accompanied by a new sleeve based on the "Imaginary Gift" design. The first Booster Set of the Standard format, BT01: UNITE! TEAM Q4! will launch in Japan May 25th, 2018, and in English June 22nd, 2018. The accompanying new anime series, codenamed "Origin," will begin airing May 5th, 2018, on TV Tokyo and affiliated stations. It will be simulcast with English subtitles on YouTube and Crunchyroll. Thank you for 4 million hits!